Do you enjoy helping people make decisions? Do you enjoy telemarketing in general? Do you have the power of persuasion to convert sales leads? Then eDegree Advisor might be the place for you. What Exactly is eDegree Advisor? 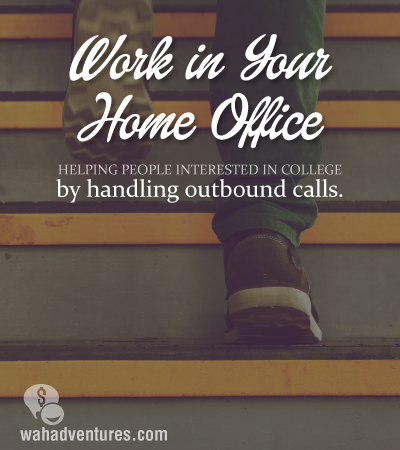 The company, eDegree Advisor, formerly known as Helios Media is a telemarketing company that hires outbound calling agents to contact people, who have expressed an interest in starting or going back to college. What Do Remote Agents Do at eDegree Advisor? The eDegree Advisor telemarketers are sent outbound calls via their computers. Their telephone system will dial the phone for you, and you are expected to speak with the person and make a sales conversion. You will try to get them interested enough in a college to transfer them to an admissions counselor to schedule an appointment. Training is paid. You will train in the beginning and then again before getting on the phones. Upon successful completion of both trainings, you will be given $75. an updated, hardwired PC or laptop with high-speed Internet of at least 1.45 mbp. a USB headphone with noise cancelling and a mic. a Skype account for training and management communication. You will also need to pass an assessment to work there. I understand these requirements are mostly common sense, and anyone who has ever worked a service job should be able to pass their initial assessment. This particular assessment is conducted to test you on customer service skills and how you would handle certain situations. The shifts are usually 4 hours in length and usually run between 11:00 a.m. to around 5:30 p.m. PST, Monday through Friday with an occasional Saturday. You are an independent contractor and responsible for your own taxes as an online agent working for eDegree. The pay itself is between $10 to $13 an hour with commissions. Some workers claim to make up to $18 an hour after commissions. Payday is every two weeks by direct deposit on the 5th and 20th of each month. What is My Overall Impression of eDegree Advisor? The reviews are mixed with more negative than positive. You can certainly conduct your own Google search, but mine yielded disgruntled workers, who complained that the company was quick to hire and quick to fire. I read through about one hour’s worth of mixed reviews. There were stories of workers, who were sick and called in to clear it with the manager. Then even after their manager’s okay, their account was suspended. There were other stories of workers, who complained about the call routing being so overloaded, that good sales calls were dropped as more calls were pushed through. Other workers complained about a lack of good leads citing that most of the calls were bogus leads or wrong numbers, which also counted against the telemarketer. I would say to try this company at your own risk. Now on the flip side of the coin, there were those claiming to be top earners and making good money while enjoying the work. How Can Someone Interested Apply? Interested individuals may go to the website and click on the apply button. I’m a former employee of this company and I can honestly say that the only thing that I liked about it was the paycheck, the ablility to see how much I was getting paid and being able to make my schedule. This job is very performance based driven and the company practices deceptive business practices by acquiring people’s information from online sights while they are applying for jobs. I can’t begin to tell you how many people told me that they were TOLD that the person I’m going to transfer you to is going to help you with a job search. So imagine my surprise when they interrupt me to tell me this and I’m explaining to them that I do school searches only then comes the cursing, the rudeness, etc. Or others who have already said no to the school searches prior to talking to me and are still receiving phone calls on a regular basis sometimes 3 and 4 times a week. If the person does not specifically request to be placed on the Do Not Call list the call is marked as Not Interested and apparently it still goes back into the leads as a call back! There were some indiviudals who were willing to complete the school search but you will be told to say that the call will only be a few minutes when actually the call can last upwards to 20 minutes because you are pushed to find at least 4 schools. After a month it became very unfulfilling and I found myself becoming anxious the closer it got for my scheduled work hours. I didn’t officially quit I just stop signing in for work and after 3 strikes (no shows) I received an email that stated “eDegree Agent, ?you have received three strikes. For this reason, your contract with eDegree Advisor is terminated, effective immediately.” I knew about the 3 strikes ahead of time so it didn’t come as a surprise. The team lead sent out emails once I acquired my first and second strike. For those that are thick-skinned and have no problem lying then I say go for it because there is definitely money to be made at this company. There is an early shift differential, an evening differential and they have all types of incentives and contests and on Saturdays I was making $4.00 over my hourly wage. For those who believe in being honest, and upright you may have issues with this company’s business practices and may dread working there regardless of how much money you make. Either way, good luck. @CMJ – I was actually told a similar story to this from another former employee just a few days ago. Thanks for commenting. I totally agree with you. I worked for them for a month and absolutely hated it by my 3rd week. I was either getting people who had no idea who we even were or people that had been on some job boards looking for a job. Then they would ask me how I even got their name and number. Not to mention the yodelers! After they supposedly pre qualified them they would ask me why the yodeler didnt even listen to them as they were not even interested in going back to school for one reason or another. Think they let me go cause I started telling people what was really going on. It may be a legit job, but it really stinks! How many times can you take the quiz, before having to reapply? Yeah, I just got terminated by the company yesterday because of poor performance. I was only there for a week and a half! One of the supervisors skyped me and asked me the day before if I needed help and I said yes and she never talked to me about helping me. I tried logging in yesterday and I couldn’t so I asked her and she said I had the poor performance. They really don’t help you, they just want you to hassle people that don’t realize what they sign up for then you get yelled at if you try and keep them on the line. Legit company, horrible with their employees! I work for this company back in November of 2014 and after a few weeks they terminated me. Apparently while on a call getting the 4th school for the customer I was told that I didn’t get the customer permission to proceed when I actually did. At that time I didn’t have a headset and the calls being recorded wasn’t always captured as I was using just my home internet. It was pretty dumb how they terminated me. Yodelers weren’t even real they were just a recorded line that would just play.